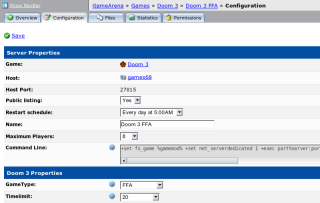 GameCreate is a powerful game server management software solution (or "game panel"), that allows game service administrators to manage all of their services from a single web interface. See the licensing page for more information on how you may use GameCreate for free or as a co-located solution. GameCreate has now officially dropped the beta tag and has been released for free. An unlimited amount of hosts are now permitted under a domain at no cost. 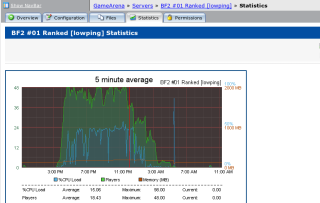 For customers with large numbers of game servers and who require guaranteed uptimes, the GameCreate software can be self-hosted in a data centre of your choice. The software installation is managed by our company and is covered by a Service Level Agreement (SLA) providing a dedicated solution to your business. For more information about a self-hosted solution, visit the GameCreate Licensing page for more information. provides comprehensive statistical and alarming capabilities. The features page has more information on GameCreate. The GameCreate team welcomes all interested parties to use GameCreate to use the service at no cost. The GameCreate solution will suit Game Services that are looking for a way to automate day to day game server management. GameCreate will give you the ability to automate your public game server management, offer bookable servers to your users, and produce statistics and game status information for your site. Installation is painless: within minutes you could have a computer set up with the GameCreate software. 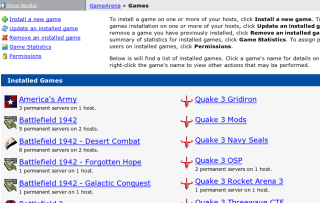 There are no restrictions with using GameCreate for free when hosted by our infrastructure. For customers with large numbers of game servers and who require guaranteed uptimes, the GameCreate software can be self-hosted in a data centre of your choice. For more information on self-hosting, visit the licensing page.